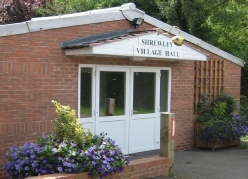 The present Village Hall replaced the old rustic ‘Hut’ in the 1960’s. Situated in the heart of the village, the Hall is a lovely, well equipped amenity with a large stage and back-stage area, committee room, and full kitchen facilities. There is parking at the front and a grassy area at the back for outdoor functions. 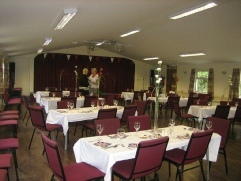 The Hall is available for hire and makes an excellent venue for parties and meetings, with a seated capacity of 100 with comfortable chairs and tables. The Hall is at the centre of community activities and hosts several live musical events throughout the year. Local societies hold well attended meetings in the Hall, including the Garden Society, the WI and the Shrewley Social Club. the Central Warwickshire Leader Programme, supporting arts projects that bring villages together.